USS Ronald Reagan (CVN-76), the ninth and penultimate Nimitz-class supercarrier, was the first ship of the United States Navy to be named for former President Ronald Reagan. 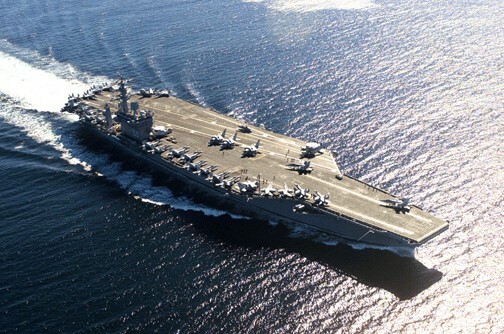 The carrier displaces approximately 95,000 tons of water fully loaded and has a top speed of over 30 knots, powered by two nuclear reactors driving four screws, and can sail for 20 years before refueling. She is nearly as long as the Empire State Building is tall at 1,092 feet (333 m) and is 134 feet (41 m) wide at the beam and has a flight deck 252 feet (77 m) wide. The flight deck covers over 4.5 acres (18,000 m²). She carries more than 5,500 sailors and over 80 aircraft.